Marios Papaefthymiou (UC Irvine), Michael Franklin (U. Chicago), Larry Birnbaum (Northwestern) and me. 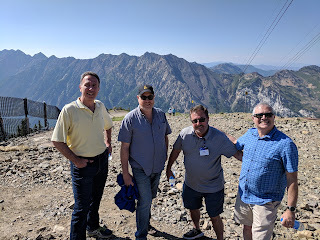 This week I attended the 2018 Computing Research Association Snowbird conference, a biennial meeting of Computer Science chairs and leadership mostly from the US. This is my fifth Snowbird meeting, once as a panelist talking about publications and now four times as a chair. One cannot deny the success of computer science over the past decade. Our enrollments have jumped dramatically, our students at all levels get great jobs, CS departments are expanding. CS research and ideas play fundamental roles in society usually but not always for the better. We have our challenges, how to we hire new faculty when most PhDs take industry jobs and how to cover the increasingly heavy course enrollments, but we do not have the existential discussions you might find in similar meetings in other disciplines. While the best part of the meeting happens in informal discussions in the hallways and on the mountain, several sessions bring out some specific topics in the minds of participants. A few that caught my interest. In the first Snowbird of the #metoo era, we had some good discussion and a few scary stories about what women face at conferences and academic departments. The ACM has a new conference harassment policy and many CS communities, including theoretical computer science, are tackling this issue head on. This is part of a longer and larger struggle the field has had in attracting and retaining women and underrepresented minorities into the community. One session focused on pushing metric-based rankings of computer science programs with presentations of Microsoft Academic Search, CRA’s own CS metrics and Emery Berger’s CS Rankings. CS Rankings has grown in popularity, particularly among undergrads looking at grad schools and Emery discussed how he’s created an advisory board that carefully considers how to count papers. Personally I prefer the reputation-based rankings like US News, but I was definitely the tiny minority in the room. I was told that Princeton Law School often gets voted for as a top program in reputation-based rankings. Were you really told that or did you just make it up. I've heard it too but it is probably apocryphal based on an old NYT article. Also, Princeton gives honorary degrees in law, which is just weird on weird.